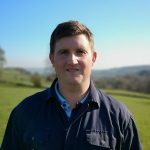 Written by Nick Grayson, Future Farmers of Yorkshire member kindly sponsored by the Yorkshire Agricultural Society and the NFU North East Office to attend the NFU Conference 2019. Travelling into central Birmingham on the train during rush hour on a weekday morning, wearing a shirt and tie was the first culture shock for me – it gave me time to become a little apprehensive about what I was about to be faced with. Who would I talk to? Would I stick out like a sore thumb? Were my chinos the right colour? The train pulled into Birmingham New Street and I eagerly exited the station and began following Google maps towards the ICC. Within 5 minutes of walking I soon began seeing men adorned in tweed jackets heading in the same direction as myself and as the destination became closer and the number of tweed jackets around me grew, I knew I was heading in the right direction! After arriving at the ICC and completing the formalities of registration and bag drop I grabbed myself a coffee and began to have a little wander to see if I could bump into any familiar faces. Before too much time had passed I met up with a guy who I regularly speak to on twitter, fantastic! I knew someone! It was now time to take our seats, where you are then seated within your own NFU region delegates. This was my first chance to say a quick hello to the other future farmers of Yorkshire delegates. Possibly one of the most inspiring speeches at the conference for me was the opening speech by Minette Batters, with her confirming to me that with her and her team at the helm of the NFU ship at such a turbulent time for British agriculture, we could not be in safer hands. Following Minette’s fantastic speech, it was the turn of Michael Gove. Being the absolute politician that he is he managed to duck any awkward points Minette had raised previously and spent the majority of his time praising Minette and her superb leadership skills. Following on from the political sessions in the programme was a session entitled: “The Future of Food, where are we Going?” – in this session there was one stand out speaker for me and possibly the entire conference that was Jack Bobo, Vice President, Global Policy and Government Affairs, Interexon Corporation. Jack gave the most fantastic presentation. He gave some incredible insights into world food production over the coming years and also consumer perceptions of agriculture. Jack made several points which have stuck with me, the most hard hitting being “the next 30 years are not just the most important there has ever been in the history of agriculture, but they are the most important there will ever be in the history of agriculture”. After lunch it was the breakout sessions, I had chosen ‘A Taste for the Future’. A stand out speaker of this session was Eve Simmons, Deputy Health Editor for the Mail on Sunday. 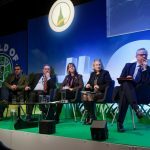 Eve didn’t conform to the standard NFU conference presenter but made some excellent points in a very different style to what we had seen previously so far that day. Following on from this session was one more short talk before it was time to head back to the hotel to get changed for Dinner and the regional awards. Dinner provided a brilliant opportunity to not only get to know the fellow Future Farmers of Yorkshire delegates but also the NFU North East team. There was some great food on offer, along with copious amounts of wine and a brilliantly funny after dinner speaker! For some people this is where day one ended, for others it continued in Walkabout Bar on Broad Street! Day 2 started quite hazily for some reason, but again another excellent day of sessions – the highlight for me being the political session titled ‘Brexit, where next?’ with speakers including Steve Richards, Political Commentator who highlighted some very interesting points regarding the Brexit process as a whole. Minette then once again took to the stage for a closing address and again made a fantastic speech, leaving us all inspired to return home to our own farms. Almost two weeks on I still have a feeling of inspiration and rejuvenated passion for the future of agriculture, since returning home from the conference. For anyone attending for the first time I would say go with an open mind, don’t expect to agree with every word every speaker says, but try to filter through and pick out the sound bites of excellence and inspiration that are there. You will meet some fantastic people, everyone was so friendly and chatted to me as though we had been friends for years and finally, expect minimal amounts of sleep, it turns out Walkabout Bar doesn’t close until 4am, and the first session of Day 2 begins at 8am!